Available online is a free listing and transcription of obituaries from around the United States. It is called OBITCITY. It developed from individuals sharing family and friends print obituaries and just grew from there. It is organized by state names and within each state the letter for a surname, such as ‘A-H’. Click on the state the person might have had an obituary and then their surname. Many families have in the past and some today still place an obituary for a loved one in multiple hometown newspapers. An obituary might be the town they grew up in, one where they lived most of their life and one where they retired to. So always check many locations. Since this database is a ‘labor of love’ of donations, not every obituary ever printed in this listing. However, as more donations come in, they are added. You also can submit any number of obituaries to be placed on the database. Check the top tab for submitting an obituary for details. 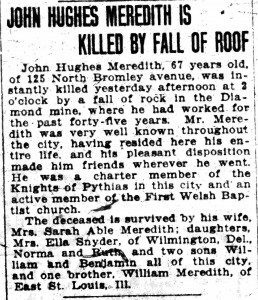 From many of the obituaries like OBITCITY you learn their birth and death date, who they married, where they lived and many time also childrens, parents or siblings names. Best are the ones that cover details of their life, organizations they were members, occupations, etc. So it is good to check all relatives on a family tree, even great uncles and grand cousins. KEEP in mind that obituaries are written by family members, so there can be some errors. MIAMI, FLORIDA: C.W. “Doc” Abele, 75, died May 4, 1963. He aided in the development of the Miami Country Day and Residence School for Boys (now the Miami Country Day School), and was a director at Camp Cloudmont in Valley Head, AL. He was a YMCA administrator and a 32nd degree Mason. He was a former resident of Peoria, IL, and had been in the Miami area for over 40 years. He was survived by his wife, Elizabeth Abele. Services were held at the Episcopal Church of the Resurrection in Biscayne Park. Arrangements were handled by Lithgow Funeral Home.